Coverage: Live Test Match Special radio and text commentary on every match on BBC Radio 5 live sports extra & BBC Sport website, plus desktop, tablets, mobiles and app. England begin their World Twenty20 campaign against the West Indies on Wednesday with bowlers David Willey and Liam Plunkett hoping to claim the final place in the team in Mumbai. Both impressed in a warm-up match against a Mumbai XI on Sunday. Plunkett bowled three good overs and Willey - who played for the hosts - took a hat-trick against England. 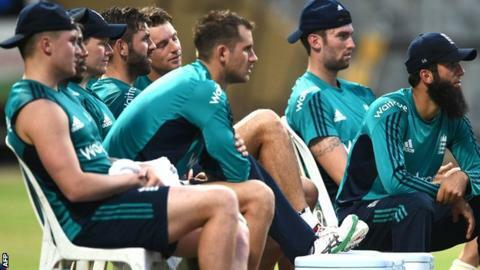 "I have an idea in my head," said England captain Eoin Morgan when asked about who he plans to select. England will reveal their XI shortly before the game, which gets under way in the Indian west coast city of Mumbai at 14:00 GMT. "Plunkett is an important player in the squad, with his extra bit of height and different trajectory to everyone else," added Morgan. "Wills swings it up front, comes back into the middle and bowls change-ups. He has a canny knack of taking wickets and that's something that we've struggled doing for a while. "That's one of his strengths." England, winners of the 2010 World T20, exited at the group stage at the previous edition of the competition. Have you added the new Top Story alerts in the BBC Sport app? Simply head to the menu in the app - and don't forget you can also add alerts for the Six Nations, cricket scores, your football team and more.